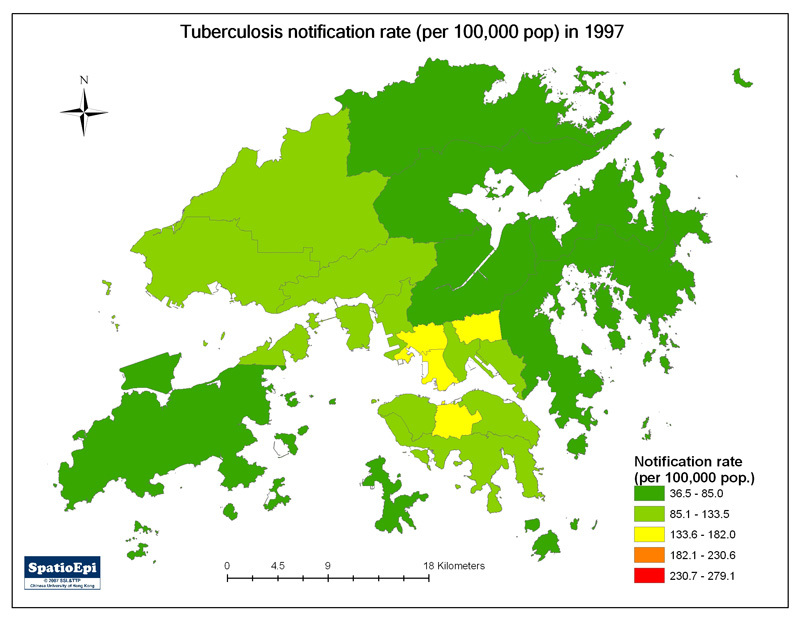 Tuberculosis (TB) has continued to be an important public health problem around the world. The map shows the reported number of new and relapse cases in Asian countries, using data deposited with the World Health Organisation. Countries coloured purple (including China) have a larger TB population. The yellow areas are supposed to be having a lower number of cases. The patterns should be interpreted with caution, as a higher number may reflect a better reporting system while a lower number could be a result of poor reporting. Tuberculosis, or TB, is a bacterial disease caused by Mycobacterium tuberculosis, which most commonly affects the lungs. In healthy people, infection with Mycobacterium tuberculosis often causes no symptom, since the person’s immune system acts to “wall off” the bacteria. The symptoms of active TB of the lungs are cough, sometimes with sputum or blood, chest pain, general weakness, weight loss, fever and night sweats. Tuberculosis is normally treated with a six to nine-month course of antibiotics. TB is transmitted from person to person via droplets from the throat and lungs of people with the active respiratory infection. BCG, or bacillus Calmette-Guérin, is a vaccine for tuberculosis disease. In Hong Kong, all the new born babies receive BCG vaccine as a part of the childhood immunisation programme. Vaccination does not guarantee protection.